New York, NEW YORK — Fariza Gulomikova is one of the few, if not only, students at The King’s College who grew up in the Muslim faith and in a Muslim culture. Prayer isn’t an unfamiliar concept for her. But the manner of prayer in her new faith, Christianity, is much different from that of her previous faith. “It had to be in Arabic,” Gulomikova said, remembering her mandatory twice-a-day prayers as a 10-year-old growing up in Tajikistan. “I had no idea what I was doing. It was part of my culture.” Many Muslims pray five times a day, but she only prayed in the morning and evening. Taking time to ensure she translated her thoughts properly into English, Gulomikova told the Tribune the predominately Islamic society she grew up in--85 percent of Tajiks are Sunni Muslim; five percent are Shiite--dictated how she and others were to behave. To avoid criticism or judgment, Gulomikova learned to comply. Tajikistan, a small country of nearly eight million people in central Asia, gained independence from the Soviet Union in 1991. Breezing over the history of her country, Gulomikova explained how directly following its independence, Tajikistan entered into a Civil War that didn’t end until 1997. Since then, the country has battled domestic terrorism, corruption, the drug trade and is among the poorest of the former Soviet regions, according to the CIA World Factbook. Many Americans take pride in going against the cultural grain. Having the ability to exercise freedom of religion and speech is a given under the First Amendment of the U.S. Constitution. But for Gulomikova, going against what is deemed proper by Tajik culture, was not the norm. Although Tajikistan’s constitution calls for protection of Civil Rights, the Sunni-led government doesn’t delineate a protection for free speech. For example, religions and religious texts face restrictions by the state. Christians in the country are a definite and minute minority. Gulomikova says that all she knew about Christianity was what society taught: Christians are infidels; they are bad—dirty—disgusting. At the young age of 10, Gulomikova began to question Islam. One of her cousins in Tajikstan told her he had been “saved” by converting to Christianity and “received Christ.” He invited her to come to church with him. “The first thing I noticed about the church was the people,” she said. She thought to herself, “They don’t know me, but they’re nice and loving.” She explains how the love she felt there was something she had never experienced from strangers before. Gulomikova’s parents are not religious in the traditional Islamic sense; they are Shi’ites, not Sunnis. “They take the good parts of the Quran. Charity, education, etc…,” Gulomikova said. Her parents have lived abroad in Moscow and other places and are considered open-minded Muslims. But Gulomikova says that, even so, her mother and father are still in denial that she is a Christian. Gulomikova remembers being bullied by her own family for her beliefs. As a teenager with a new-found faith, she recalls being excited to learn more about Christianity, but family members would often hide her Bible and other Christian books so she couldn’t read them. Gulomikova said it’s difficult that her mother, whom she loves deeply and thinks of as a best friend, does not share her faith. Gulomikova said she wishes she could tell her mother more about important things happening in her life and faith but she fears her mother wouldn’t appreciate. When asked what it feels like to be ostracized by family, friends or the government, Gulomikova shook her head and declined to offer much detail. “You have to experience that to understand,” she said. The idea that she could be a Christian openly in the United States was a large part of her decision to come to the country to pursue higher education. Because her father has always supported her education, Gulomikova believes that’s probably the primary reason why he let her and her sister move to America. In October 2008, Gulomikova first settled in Omaha, Neb. where her older sister Nelly was living at the time and attending college. She experienced major culture-shock--one of the biggest shocks being the sight of so many overweight people. Only 8.6 percent of people in her home country are considered obese. She was also used to living in a large metropolis (Moscow) and found Omaha as a unique, smaller city in the prairie. 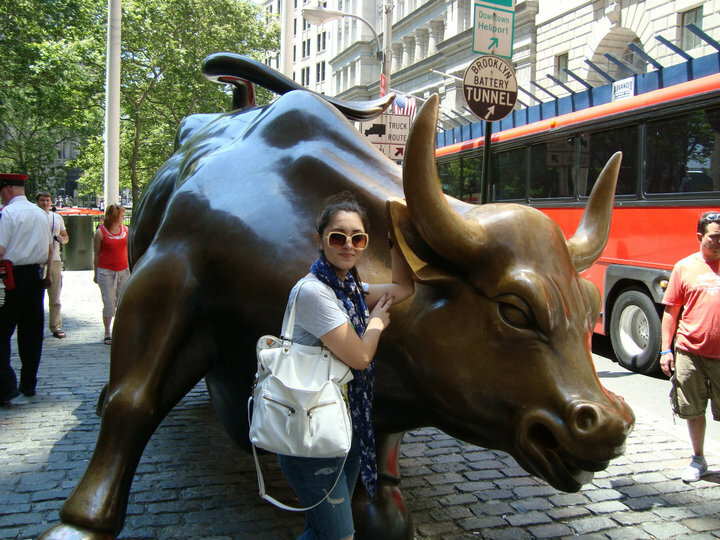 Later, in June 2010, Gulomikova visited a friend in New York City and immediately felt at home. That December, she moved to New York, where she earned her associate’s degree in Fashion Design from Kingsborough Community College in Brooklyn. Gulomikova wanted to attend the Fashion Institute of Technology in New York, but her sister, who works at King’s in the business office, convinced her to apply to The King’s College. Gulomikova is currently majoring in Media, Culture and the Arts at King's. Despite the pains of its academic rigor, she’s happy to be a part of a small Christian community. Gulomikova said that when she was preparing to come to the United States, she remembers being so excited that she was going to a “Christian country.” She now describes that as her “naïve perception” of America; however, the freedom she feels here surpasses any that she had in Tajikistan. Gulomikova said she not only feels the freedom to believe what she wants, but she has the reassurance that she can voice those beliefs. Now, she attends a Hillsong church and is active both in community life both at her church and in her house and extracurricular groups at King’s such as the international student group. While Gulomikova was able to come to America and pursue her education along with her faith, she mentioned other family members who have converted to Christianity are facing less freedom and more pressure in Tajikistan. Some have stopped attending church because of the criticism and shunning they encountered from friends and family. Family is highly valued in Persian culture, and being shunned or ignored by family is a type of suffering. As she looks forward to her own intellectual and spiritual growth, Gulimikova said she believes God will continue the work he has started in her family.